In 1992, global production of all tea was almost 2.5 million tons. The majority of tea production occurs in the subtropical areas of Asia, including China, India, Sri Lanka, Japan, and Indonesia. More than 35 countries now produce tea, with India, China, and Sri Lanka the leaders. Black tea is the most produced, followed by oolong and jasmine tea. Besides the distinction between varieties of tea, the major difference between the type of teas is the processing method. Green tea leaves are picked and immediately sent to be dried or steamed to prevent fermentation, whereas black tea and other types are left to ferment after they are picked. Green tea originated in China for medicinal purposes, and its first recorded use was 4,000 years ago. By the third century, it became a daily drink and cultivation and processing began. Today, China has hundreds of different types of green teas. Other producers of green tea include India, Indonesia, Korea, Nepal, Sri Lanka, Taiwan, and Vietnam. Green tea was first introduced in Japan during the Nara period (710-794), when numerous Japanese Buddhist monks visited China and brought tea seeds back to Japan. The Japanese tea industry is said to have begun in 1191, when the monk Eisai planted tea seeds from China on temple land. He then encouraged the cultivation of tea in other areas of Japan by extolling the health benefits of tea drinking. The making and serving tea as an art form (sado, the way of tea) was introduced in Japan during the eleventh century. The origins go back to China's Tang dynasty (618-907), when a ritual was performed in Buddhist temples. A brick of tea was ground to a powder, mixed in a kettle with hot water, and ladled into ceramic bowls. One of the first Japanese uses of the tea ceremony in public was when Toyotomi Hideyoshi, then the most powerful warlord in Japan, held a tea party in his camp the evening before a large battle in order to calm his warriors and inspire morale. Hideyoshi's own sado teacher, Senno Rikyo, is also credited with elevating tea from a simple beverage to a highly respected method of self-realization. Today, there are tea schools in Japan to learn the proper methods of the tea ceremony or chanoyu. The Urasenke School is the most active and has the largest following. The form of chanoyu that is practiced today was established in the second half of the sixteenth century by Rikyu. Chanoyu involves more than merely enjoying a cup of tea in a stylized manner. The ceremony developed under the influence of Zen Buddhism aims to purify the soul by becoming one with nature. The true spirit of the tea ceremony has been described by such terms as calmness, rusticity, and gracefulness. The rules of etiquette are carefully calculated to achieve the highest possible economy of movement. For some 500 years after tea was introduced to Japan, it was used in its powdered form only. It was not until the mid-sixteenth century that the processing method for conventional green tea was invented. Prior to the Edo period (1600-1868), the consumption of tea was limited to the ruling class. Only after the beginning of the twentieth century, with the introduction of mass production techniques, did tea achieve widespread popularity among the general population. Today, tea leaves for green tea are grown in the warmer southern regions of Japan, with about half produced in Shizuoka Prefecture. Uji, a district near the ancient city of Kyoto (and the district from which the finest Japanese tea comes from to this day) became the first tea-growing region in Japan. Later, tea plantations were planted in Shizuoka Prefecture and, finally to surrounding regions. A total of about 100,000 tons of green tea is produced per year from 60,000 hectares of tea fields. Only green tea is produced in Japan. Though traditionally green tea was produced manually, the process has been fully mechanized in Japan. The various types of tea now produced differ according to cultivation practices and processing methods. Sencha is a tea with three quality levels: high, medium, and low. It is manufactured from the tender top two leaves and the shoots for the high and medium grades and from the third from the top leaf for the low grade. Sencha, which comprises 80% of all green tea production, consists of tiny dark green needle-shaped pieces. Almost immediately after picking, the leaves are steamed for about 30 seconds to seal in the flavor, followed by drying, pressing, and rolling steps. Gyokura is the highest grade of tea and is made from the most tender leaves that are grown under 90% shade using bamboo blinds. Matcha is made from similar leaves and is processed into a powder form for exclusive use in the tea ceremony. Bancha is a low-grade coarse tea made from older leaves picked after Sencha leaves are picked or picked in the summer. It is generally composed of lower grade tea leaves, which are divided into two kinds: large leaf, and small leaf. Houjicha is a wedge-shaped tea made from Bancha that is roasted at 302° F (150° C) to prevent fermentation and produces a light golden color when made. Kamairicha comes from northern Kyushu and is first roasted at 392-572°F (200-300°C) followed by cooling at 212°F (100°C). Green tea is traditionally served without sugar, milk, or lemon since these would destroy the true flavor and aroma of the tea. Green tea is made from the top two leaves and buds of a shrub, Camellia sinensis, of the family Theaceace and the order Theales. This order consists of 40 genera of trees or shrubs that have evergreen leaves, flowers with five sepal or leaf-like structures and petals. The genus Camellia consists of 80 species of East Asian evergreen shrubs and trees. Besides the leaves, other ingredients may be added to create special scents or flavors during the drying process, such as jasmine, flowers, or fruits. The tea plant originates in an area between India and China. There are three main varieties of this plant—China, Assam, and Cambodia—and a number of hybrids in between. The China variety grows as high as 9 ft (2.7 m) and has an economic life of at least 100 years. The Assam variety is a tree that grows as high as 60 ft (18.3 m), with an economic life of 40 years dependent upon regular pruning and plucking. The 16 ft (4.9 m) high Cambodia variety is naturally crossed with other varieties. 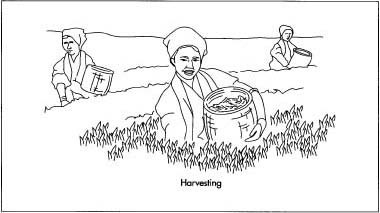 1 A suitable climate for cultivation has a minimum annual rainfall of 45-50 in (114.3-127 cm). Tea soils must be acid since tea plants will not grow in alkaline soils. A desirable pH value is 5.8-5.4 or less. Tea can be cultivated up to 7,218.2 ft (2,200 m) above sea level and can grow between the equator and the forty-fifth latitude. The plants are reproduced through tile-laying or through seeds from trees that have grown freely. 2 A crop of 1,500 lb (681 kg) of tea per acre requires up to two workers per acre to pluck the tea shoots by hand and maintain the field. The tea plant is generally plucked every five to 10 days, depending on where it grows. The length of time needed for the plucked shoot to redevelop a new shoot ready for plucking varies according to the plucking system and the climatic conditions. Intervals of between 70-90 days are common. Harvesting an average tea planting of 1,500 lb (681 kg) of tea per acre requires up to two workers per acre to pluck the tea shoots by hand and maintain the field. The tea plant is generally plucked every five to 10 days, and the length of time needed for the plucked shoot to redevelop a new shoot ready for plucking varies according to the plucking system and the climatic conditions. Intervals of between 70-90 days are common. A bud and several leaves are picked from each plant. In Japan, the first crop is harvested in April and May, the second crop in June, the third crop in July and the final crop in September. 3 In Japan, the tea harvesting begins around the end of April, with the leaves picked by hand or machine. A bud and several leaves are picked from each plant. The first crop is harvested in April and May, the second crop in June, the third crop in July and the final crop in September. For gyokuro or matcha tea, the plants are shaded for two weeks after the first bud comes out in spring before picking. The leaves are then shipped to the factory for processing. Since not all can be processed at once, the leaves are stored in a large bin that is kept at the proper temperature by blowing cool air into the bottom. 5 In Japan, steaming is normally used. Before the steaming process begins, the tea leaves are sorted and cleaned. The steaming time determines the type of tea that is produced. Sencha tea is normally steamed for 30-90 seconds. Another type of sencha called fukamushi is steamed for 90-150 seconds to produce a flaky light yellowish green tea. Steaming is conducted in a bamboo tray over water or by a revolving or belt-conveyor type machine. After mechanical steaming, the leaves go into a cooling machine that blows the water from the leaves. 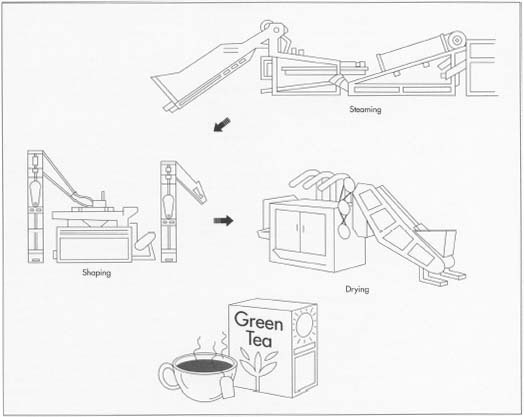 6 In most countries, rolling or shaping green tea leaves is done by machinery. In China, high-end leaves are hand-rolled into various shapes, including curly, twisted, pointed, round, and more. Rolling the tea creates a distinctive look, as well as regulates the release of natural substances and flavor when it is steeped in the cup. 7 In Japan, a number of rolling and drying steps take place. A special machine is used to accomplish the first rolling and drying steps simultaneously and takes about 48 minutes. The tea leaves are dried to improve their strength so they can be pressed during the next drying process. Moisture from both the surface and from the inside of the tea leaves is removed using this machine. Once harvested, the tea leaves are dried in order to prevent fermentation. In China, pan firing is used. In Japan, the leaves are steam dried. The dried leaves are then shaped or rolled in order to regulate the release of natural substances and flavor when it is steeped in the cup, as well as create a uniformly rounded leaf. In Japan, the tea is dried once more to reduce its moisture content to about 5% before packaging. for the operator to touch the tea by hand to make sure it feels right. 9 Since the moisture level still varies for different parts of a leaf or from one leaf to another at the end of the first step, another rolling process takes place to uniformly distribute the remaining moisture in the leaves. This process rolls the leaves by pressing under a rotating disk to bring the moisture from the center of the leaves to the surface. The process is conducted at room temperature for 24 minutes. 10 Next, the leaves go to another rolling/drying machine, which uses a spinning pedal inside of a revolving drum to convert the leaves into a round shape. This process takes about 40 minutes. It is very important to take out the leaves at the same moisture level every time. 11 The tea leaves are removed from the previous machine, separated into small portions and placed in pots. They are gradually rolled into tiny round or needle shapes using a weight. This step takes 40 minutes and removes most of the moisture. The total process thus far takes about three hours compared to hand rolling and heating which can take up to 10 hours. 12 In Japan, green tea must be dried for about 30 minutes after the final rolling step for storage. The tea is spread on a caterpillar-type device and dried slowly to about 5% moisture content or less. At this stage the half-processed tea, called aracha, is shipped to tea merchants or wholesalers for final processing. Aracha is not uniform in size and still contains stems and dust. 13 After the tea is shipped to the wholesalers in Japan, it undergoes several other steps to produce the final product. A special machine grades and cuts the tea by particle size, shape, and cleanliness, depending on the final qualities desired. The machine uses mechanical sieves or sifters fitted with meshes of appropriate size, as well as cutting devices to achieve a quality tea. Another drying step follows to produce the aromatic flavor, followed by blending per customer's specifications, packing and finally shipping to retail shops. In other countries, similar sorting, weighing, and packaging steps occur after the shaping process. The quality of green tea depends first on using good tea leaves. The natural quality of the leaf, including color and aroma, must then be preserved during the manufacturing process to produce a good green tea. In Japan, this involves controlling the temperature to 93.2-96.8° F (34-36° C) during rolling, drying, and storage. Since tea leaves can generate their own heat, cool air is blown into the bottom of the container to keep the leaves at the proper temperature during storage. The Japanese government also subjects all exported tea to a strict inspection. Standard samples, which are established at the beginning of the tea season each year, are used to compare various properties of the finished product with the samples. Leaves, stems, moisture, content, flavor, taste, and color are all rigidly examined. There is also a stringent chemical analysis to determine tannin, caffeine, vitamin, and mineral contents. Tea is exported only after passing these tests. Though the health benefits of green tea have been known for centuries, recent research is providing concrete evidence of these benefits. Studies have shown that green tea can prevent cancer since it contains catechin, the major component of tea. A study in Japan showed that residents in areas devoted to green tea production in the central and western regions of Shizuoka Prefecture, who drink the tea daily, have a significantly lower death rate for all types of cancer compared to other regions. These findings were supported by animal experiments that showed green tea reduced the growth of tumors. Other research has shown that green tea consumption may inhibit nitrosamine formation—known carcinogens or cancer-causing chemicals. Green tea catechin has also been shown to limit the excessive rise in blood cholesterol in both animals and humans, as well as prevent high blood pressure. Other benefits of catechin include killing bacteria and influenza viruses, preventing halitosis, inhibiting increase of blood sugar, and fighting cariogenic bacteria. Green tea (especially matcha) also contains important vitamins (C, B complex, and E), fluoride (for preventing cavities), amino acids (for lowering blood pressure), and polysaccharides (lowers blood sugar). Green tea is a strong antioxidant as well and is even more powerful than vitamin E or vitamin C due to the presence of polyphenols, such as epigallocatechin gallate (EGCG). Extracts of green tea may also make strains of drug-resistant bacteria that cause skin infections more sensitive to penicillin, British researchers report. The investigators also found that diluted tea extract acted synergistically with antibiotics, making them more potent against particular strains of this type of bacteria. In addition to preventing or curing these more common diseases, preliminary research indicates the antiviral capability of green tea catechin may have some beneficial effect in fighting AIDS. Laboratory tests have verified that catechin can inhibit the activity of the AIDS virus. Instead of simply being known as a popular Japanese beverage, green tea may thus become an important "new" medicine of the twenty-first century for the entire world. Mitscher, Lester A. and Victoria Dolby. The Green Tea Book: China's Fountain of Youth. Avery Publishing Group, 1997. Oguni, Dr. Itaro. Green Tea and Human Health. University of Shizuoka, Japan Tea Exporters' Association. Okakura, Kakuzo. The Book of Tea. Dover Publications Inc., 1964. Rosen, Diana. The Book of Green Tea. Storey Books Inc., 1998. Japan Tea Exporter's Association. 17 Kitabancho, Shizuoka, Japan 420-0005. +81-54-271-3428. Fax: +81-54-271-2177. Maruichi Green Tea Farm. http://www.maruichi-jp.com (February 2, 1999). The Teaman's Tea Talk. http://www.teatalk.com (June 30, 1998). The Teapot Salon. http://www.iris.orjp/-hamadaen/ (1996). This is very good infomation on educating on the process of tea making, but more infomation is neeeded on how the tea is pakaged and transported to the different places where they undergo the process of being placed in their packaging and the modes of transportation, also where it is transported. Basically, the infomation on how,where and what happens at each place the tea is transported to should be added to the infomation above. But overall very good infomation and would recommend to anyone looking for infomation on tea manufactoring.